The Tefal Fresh Express seems to be a bit like Marmite, some people love it and some people loath it. From all of the online demos and the adverts on the TV, it looks like a very useful and practical product. I hate slicing and grating so this electric food slicer and grater looks like a perfect addition to my kitchen, for making salads and grating cheese with very little effort and minimal fuss. Some reviews are suggesting that it does not chop consistently and that the feeder is too small for some larger items, which can sometimes cause the machine to struggle. But are these really issues? Unless you are trying to use the machine in a professional kitchen then surely they are niggles you can overcome. For instance if the feeding tube is not wide enough to take some items, then surely you would cut the item to fit the feeding tube. I liken this to a garden shredder, what if you needed to shred some branches wider than the machine? Surely you would not blame the machine for the size of the feeding hole, you would simply make sure that whatever you wanted to feed through the machine was the correct size before you started. All in all I think this is a handy gadget and if your like a lot of people out there that are unable to chop or slice things into small enough pieces then this machine is perfect. I don't understand how people can complain that onions turn to mush when you grate them using the Fresh Express, as when I use my normal grater on onions it turns them to mush as well. The same goes for the issue where things are not evenly sliced. You have to keep the same pressure on the item as you push it through the feeding tube to keep the slices even, but surely this is a common sense issue. So you might be asking would we recommend the Tefal Fresh Express, and to be honest we are undecided here as we cant work out if it would get the used often enough as it also requires more cleaning than a conventional grater. I suppose all in all it depends on how much chopping and grating you plan on doing, but for now we see it as an expensive alternative to a decent kitchen knife and box grater! The Kenwood CH180A chopper and has been awarded by WHICH as a best buy and comes highly recommended by Delia herself! 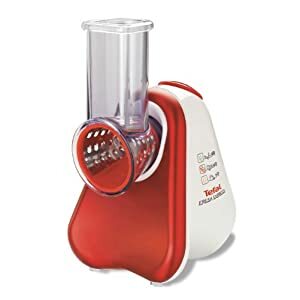 The chopper is excellent at chopping and pureeing food in seconds, plus it's small, so won't take up much kitchen space, and easy is easy to clean. 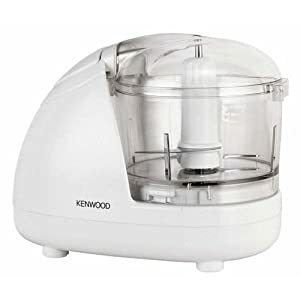 The CH180 Mini Chopper from Kenwood is a very versatile, powerful and compact mini food processor with two speeds, enabling you to control the chopping sizes. Weighing 950g, 300 Watts of power and a 350ml or 150g capacity makes the chopper a must have for your kitchen. The mini chopper is dishwasher safe and contains a stainless steel knife blade. It has a safety interlocking lid, full safety interlocks and can be operated with the touch of one button. Most importantly, the mini chopper does what it says on the box extremely well. It chops, quickly, evenly, finely (if you press the button down for a longer period of time) coarsely (if you just press the button down for a few seconds for a quick whizz!). After considerable testing the perspex is showing a few scratches, but apart from that this product has worn well, and the blade is as sharp as ever. It is really easy to operate - just a big grey button, and it works really really well. Even if you are not a Delia fan, she is right about the Kenwood CH180A mini chopper so why not go out an buy one yourself today!